One of the many things I learned this week from Von Barron, aka Captain Turner Kitt, was that no surgeon working in the field, north or south, lasted all four years of the Civil War. With the infections and diseases to which they were exposed, they just didn't last. 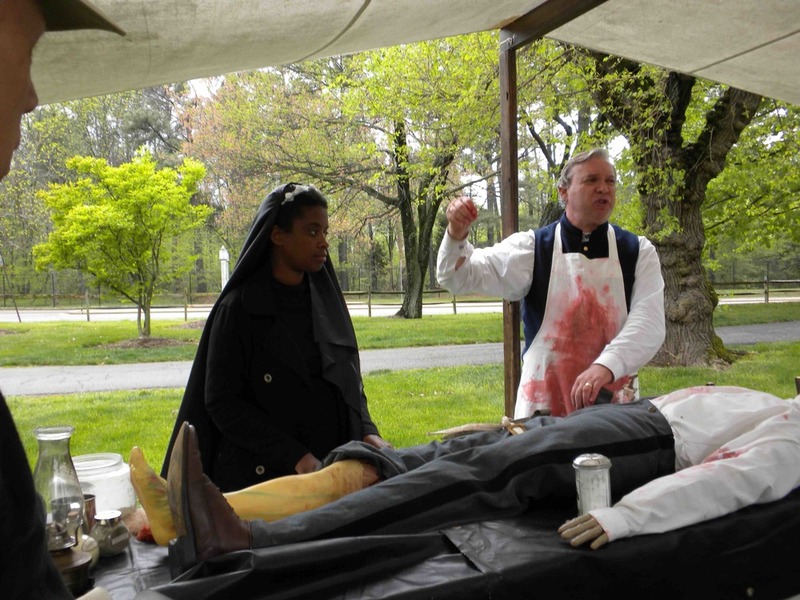 "Dr. Kitt" set up at Fort Ward Park, a restored Union camp in Alexandria, on April 23, with appropriate blood and yuck, accompanied by Heather Butts reenacting Susie King Taylor (more about her below). The war began with only a few dozen surgeons in the Army, some of whom joined the Confederacy. The Union army relied on contract surgeons--civilian doctors who hired on for a few months or so--until newly trained physicians graduated and joined up, hired at a rank of captain. Many of them went from medical school to field hospital, a sharp transition indeed. Often, medical innovations did not hold the hoped-for results. One example: doctors started using lead to pack the wounds after an amputation--they had a lot to use from bullets. Less infection was the immediate result. Unfortunately, lead poisoning set in afterwards. As for Susie King Taylor, formerly enslaved in Georgia, she fled into Union-hold territory in August of 1862. She had been educated in secret while enslaved in Savannah and started teaching. She married a soldier and moved with him and his regiment, serving as a nurse. She returned to Savannah after the war and was widowed shortly after. She moved north after the war, and published a book about her experiences in 1902.